It was an exciting night of Men’s skating at the 2013 ISU Four Continents Figure Skating Championships Saturday in Osaka, Japan. 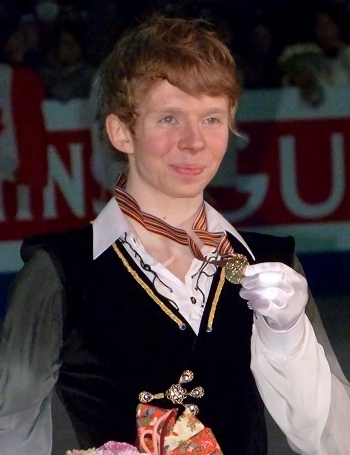 Kevin Reynolds of Canada upset the favorites to strike gold, while overnight leader Yuzuru Hanyu of Japan settled for the silver medal. China’s Han Yan clinched the bronze. World silver medalist Daisuke Takahashi of Japan faded to seventh after a major meltdown. Not many would have predicted that Reynolds would come out on top in this competitive event, but the Canadian put out the program of his life in Osaka. Skating to Concerto No. 4 in E minor by Andre Mathieu, he pulled off three solid quadruple jumps – a quad Salchow, quad toe-triple toe, and another quad toe, as well as a triple Axel-triple toe and three more triple jumps. Only the last Lutz was a bit shaky, but the performance overall was a step up from what Reynolds has done in the past. With a free skating score of 172.21 (92.21/80.00) points, Reynolds surpassed his previous personal best by more than 25 points and totaled 250.55 points to vault from sixth to first place. It was the first ISU Championship title for the 22-year-old, who has a bronze from the 2010 Four Continents Championships on his record. Hanyu got off to a good start in his routine to Notre Dame de Paris with a big quad toe, but then doubled the planned quad Salchow. The 18-year-old came back with a triple flip, a triple Axel-double toe (a little wonky), a triple Axel-double toe-double toe, a triple loop, and triple Lutz-double loop, but singled the last Lutz. He picked up a level four for his three spins and a level three for the step sequence and scored 158.73 (76.95/81.78) points, the third best free skating score. Overall, however, he dropped to second at 246.38 points. Yan hit an excellent triple Axel-triple toe in the first second of his routine to Masquerade Suite by Aram Khatchaturian, but he crashed badly on an underrotated quad toe. The World Junior Champion recovered to complete five clean triples and earned a new personal best of 150.14 (75.78/75.36) points. He was ranked fifth in the free skating and slipped from second to third at 235.22 points overall. USA’s Max Aaron moved up from 10th to fourth with the second-best free skate at 162.19 (89.63/72.56) points. The U.S. Champion nailed two quadruple Salchows (one in combination with a triple toe) and two triple Axels (one in combination with a double toe), as well as a triple Lutz in his routine set to Westside Story. The 20-year-old grew tired towards the end, however, and the last three jumps were wobbly which eventually cost him the medal as he was less than one point behind Yan. His total score was 234.65 points. Teammate Richard Dornbush could not hold on to his third place finish in the short and placed fifth overall with 234.04 points. He landed a quad-double toe and four good triples, but stumbled badly on his second quad toe and singled an Axel. Nan Song of China touched down on his quad toe, but hit a triple Axel-triple toe as well as four more triples. Some landings were tight though, and he also put his hand down on the triple Salchow. The Chinese Champion dropped one spot to sixth (228.46 points). Takahashi really struggled in his dramatic program to Pagliacci. Both quad toes were two-footed and underrotated, and he also stepped out of the first triple Axel and crashed on the second triple Axel (underrotated). The 26-year-old also stumbled again on an underrotated triple Lutz. In the end, he had only a clean triple loop, Salchow and flip. The 2010 Olympic bronze medalist found himself in 7th place with 222.77 points. He did not have much to say. Takahito Mura of Japan pulled off a quad toe, albeit a bit tight, and six triples, but he popped a Lutz and came too close to the boards on the triple flip. He placed eighth at 218.08 points. USA’s Ross Miner remained in ninth place with 214.36 points. He slipped and fell on the entry of his quad Salchow and singled an Axel, but the rest of his program was solid as usual. Andrei Rogozine of Canada was the only skater in the top ten who didn’t go for a quadruple jump. His program was highlighted by a triple Axel-triple toe, but he made a few errors on other jumps to finish 10th (201.99 points). Two more performances were notable: Misha Ge of Uzbekistan entertained the crowd as Charlie Chaplin to come in 11th (201.71 points). Except for a cheated triple Axel, his program was solid. Christopher Caluza of the Philippines had a smooth performance to Concerto de Quebec by Andre Mathieu that was well received by the crowd. However, without a triple Axel and quad, he placed 14th (186.79 points). Bothered by his ankle injury, Denis Ten of Kazakhstan dropped from seventh to 12th (197.26 points).